Looking for your summer home? Check out this Park Model located in Pye's Landing South Camp development, including the transfer of lease, and boat slip! This gem is one of the closest Lake of the Woods opportunity to Winnipeg. Get your piece of this incredible summer spot. Greater Lake of the Woods property. Enjoy the rest of Summer 2018 at Pye's on the Lake! 2008 Woodland Park, Park Model Trailer. 540 sqft. 2 bedroom. 1 bathroom w/ corner shower. 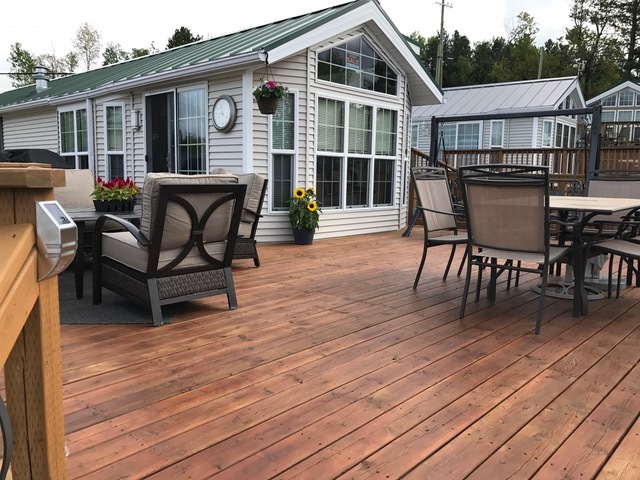 Central air and forced heat, propane furnace, full fridge, propane stove/oven, full size freezer/fridge, microwave/convection oven, dishwasher, freshly stained super large deck. DVD home theatre surround sound hard wired. Queen bed in master bedroom, bunk beds in 2nd bedroom and double pullout sofa in living room. Largest lot in the park, centrally located w good neighbours. Grassed on 3 sides including a large recreational area for kids and pets. Cozy fire pit area at the rear of lot... great for entertaining! Less than 2 hrs from Winnipeg, 20 min west of Kenora, Pye’s Landing is perfectly situated for weekend trips from Manitoba or the East! Extremely close to Rockeries Marina, Clearwater Bay Esso and LCBO. Purchase includes transfer of 5 year renewable lease and transfer of boat slip. Don't waste the rest of your summer away from the lake! Stop waiting for your friends to invite you to their cabin! Come check out Pye’s Landing and find the most affordable opportunity to get on Lake of the Woods! To view or Inquire, call Darren at (204) 793-9205!